"Our detailed data proves a much sharper view of the actual dynamics of the troposphere," says theoretical chemist Joel Bowman. 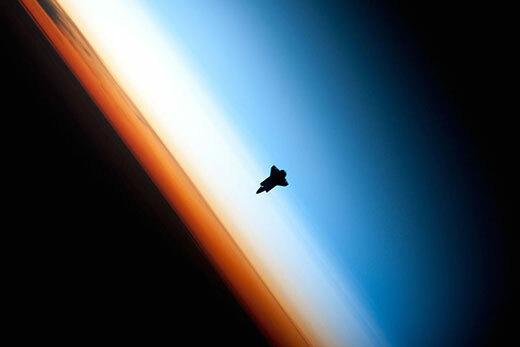 In this NASA photo of the space shuttle Endeavor, silhouetted against Earth's atmosphere, the troposphere is the orange layer. The white layer is the stratosphere and the blue is the mesosphere. Chemists have identified a cascade of reactions for how mysterious molecules known as Criegee intermediates generate hydroxyl radicals – an oxidant that helps remove pollutants from the lower atmosphere. Nature Chemistry is publishing the findings, a collaboration of Emory University and the University of Pennsylvania. The Bowman group collaborated with the lab of experimental chemist Marsha Lester at the University of Pennsylvania. The theoretical work revealed that a Criegee intermediate first produces highly energized vinyl hydroperoxide, or VHP, then rapidly decomposes to hydroxyl radicals, along with vinoxy byproducts.